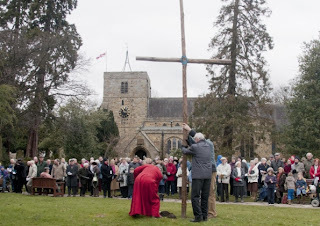 PONTELAND residents braved the cold weather to attend the Raising of the Cross ceremony. The traditional Easter event, which takes place each year on Good Friday at Coates Green, is organised by the area’s four churches. Representatives came together following their own services. Ministers taking part were Rev Joan Ross, representing Ponteland United Reformed Church, Rev Peter Barham and Rev Christine Brown, from St Mary’s Church, and Father Seamus O’Kane, of St Matthew’s RC Church. The St Mary’s Church Choir led the singing of a few hymns. Rev Barham said: “More than 200 people turned out for the event despite the very cold conditions and we’re grateful to them all.